Tonight’s debate saw the return of the Mitt Romney who ran for office in Massachusetts in 1994 and 2002. He was obsessive about portraying himself as a moderate, using every possible opening or ambiguity — and, when necessary, making them up — to shove his way to the center. Why he did not attempt to restore this pose earlier, I cannot say. Maybe he can only do it in debates. Or maybe conservatives had to reach a point of absolute desperation over his prospects before they would give him the ideological space. In any case, he dodged almost every point in the right wing canon in a way that seemed to catch Obama off guard. Romney was able to take advantage of the fact that Obama has a record, and he does not. 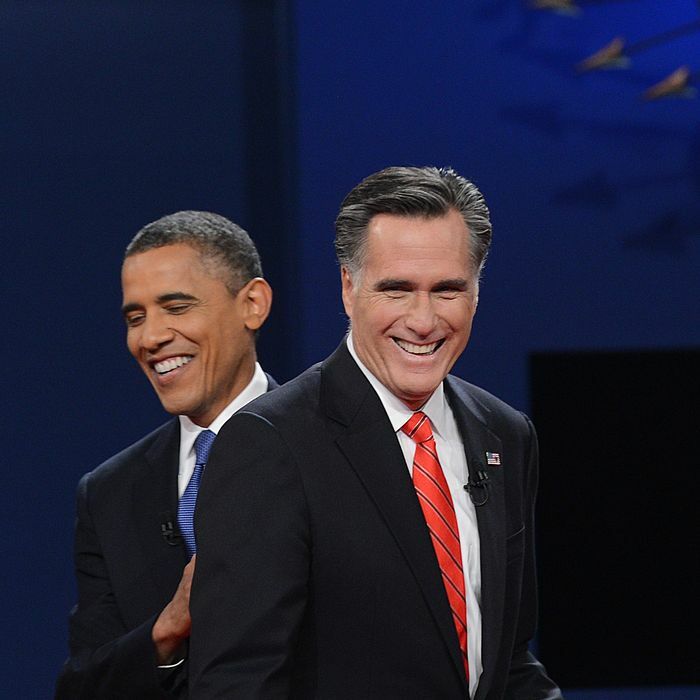 Obama has had to grapple with trade-offs, and Romney has not. So Romney is a candidate of a 20 percent cut in tax rates, a new plan to cover people with preexisting conditions, and higher defense spending, and he will accomplish it all by eliminating federal funding for PBS. He would not accept that his proposal would result in any trade-offs at all — no lower funding for education, no reductions in Medicare for anybody who is currently retired. He insisted his plan would not cut taxes for the rich, which is false. He described his proposal to allow people with continuous health insurance to keep it — a right that, as Obama already noted, already exists, and is therefore a meaningless promise — as a plan to cover all people with preexisting conditions. Romney did not waste a breath. Obama wasted many, with “uhs” and long, wonky discursions. He went on long, detailed riffs defending his policies, with attacks on Romney few and far between. Romney added little to his longstanding indictment of Obama, but defined himself far more effectively than he has before. If Romney was winning, and Obama needed to disqualify him, then he would have needed a sharper and more sustained attack on Romney’s credibility and intentions. He would have pointed out that the Romney caught on camera sneering at half of America is the real one. Of course, Romney isn’t winning. Maybe Obama was trying to execute a play-it-safe strategy. But it’s clear he missed a major opportunity in Denver to press his advantage.